Ophelia sits by the edge of the river tormented by a deep sadness. She is putting flowers in her hair preparing herself for suicide. The story of Ophelia derives from Shakespeare’s play Hamlet. Hamlet, Ophelia’s love and betrothed, rejects Ophelia and orders her to a nunnery because he is obsessed with revenge against his uncle, who he knows murdered his own father, and married his mother in order to become king. Hamlet’s bizarre behavior, which she does not understand, drives Ophelia mad, causing her to throw herself into a river, singing as she drowns. This painting portrays Ophelia and her story beautifully. 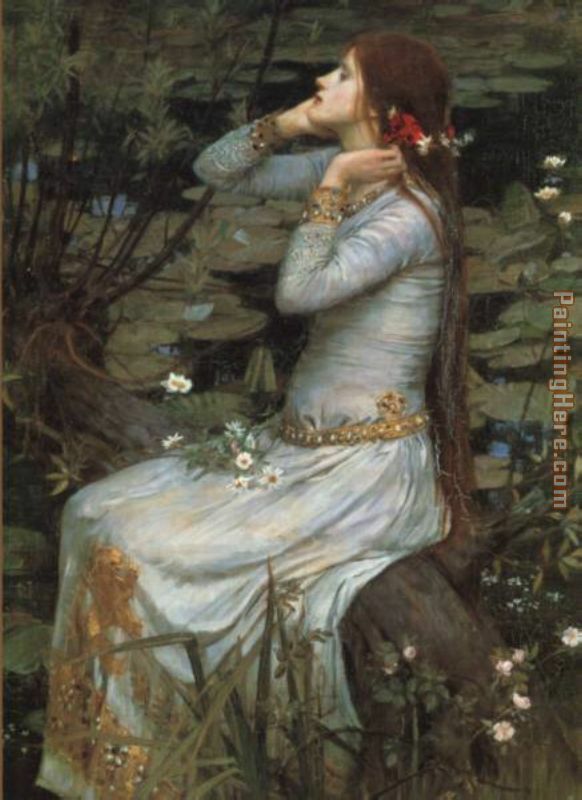 Waterhouse has truly captured the way she might have looked before her suicide, her gazing out at nothing, entranced in thought, mindlessly placing flowers in her hair, driven crazy from grief. Peter Trippi quoted that “the Art Journal noted her ‘wistful-sad look’ and observed that, ‘never can this beautiful creature, troubled with emotion, experience the joys of womanhood’” Hamlet having never actually slept with her. This painting is often compared to John Everett Millais’ Ophelia in which she is floating already dead in the water. Millais’ Ophelia was painted from 1851-1852. Beautiful, original hand-painted artwork in your home. Interpreted paintings based on the masters' works of John William Waterhouse.This Waterhouse Ophelia needs about 14 - 16days for production by a talented artist.